So. . . back we come to the building of bears! A little while before Ro’s first birthday, T and I came across a Build-A-Bear panda kit for $10 at the craft store (plus I had a 40% off coupon – yay). Well. 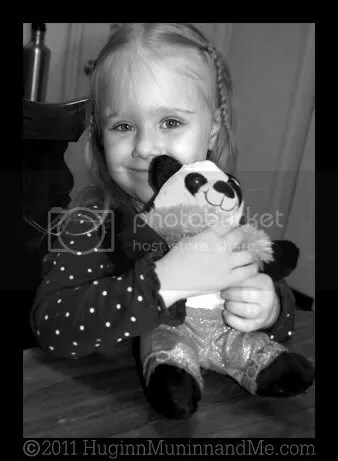 . . you KNOW she thought that it would be a fabulous thing to build her sis a panda for her birthday gift (Ro loves panda bears)! The box said for ages 6 and up, but these things don’t phase me, so we got it anyway. And this? This was COOL! This was what I was wishing the Build-A-Bear experience in-store had been. This time, Teagan actually got to BUILD a BEAR! The kit came with everything we needed, and very easy to follow instructions. Bear’s head was already put together, and her body was made from two pieces of fabric pre-cut into a bear shape, and attached at the neck. There were even tiny pre-punched holes in it to make it easy for small seamstresses to get their big plastic needles through without trouble! T was so excited that she actually got to ‘sew’ her – and it was so much FUN! It took a while and a few breaks for her to complete (and I did help her out a bit when her string got all twisted around the bear bits), but she did it almost entirely by herself. Then she got to stuff it! She had so much more fun with the hand-stuffing than she did with that scary ol’ machine in the shop! She was just delighted that the bear was literally coming to life before her eyes! Actually. . . I think she over stuffed her a little bit, but she was so determined to get ALL of the included stuffing in, I couldn’t dissuade her. In the box were fabric stickers and an outfit for Ro’s new fuzzy friend. We had some glittery fabric paint on-hand, so T went to town decorating the heck outta that outfit! We left off the shades (cuz’ Ro would get frustrated trying to tear them off, and lose them if they did come off anyway) and the sticker that said ‘diva,’ because, really? Ro can be difficult enough as it is, she doesn’t NEED to learn about being a diva! Plus Teagle was just DYING to put a sticker on her own dress. After all that fabric paint finally dried, and the bear had been stitched shut, T got her all dressed up for Ro’s birthday party! She even gift-wrapped it herself, and stuck a shiny gold bow on top! All in all this was a great project for T. She enjoyed it every step of the way, and now has a very real understanding of how her stuffed animals are built. 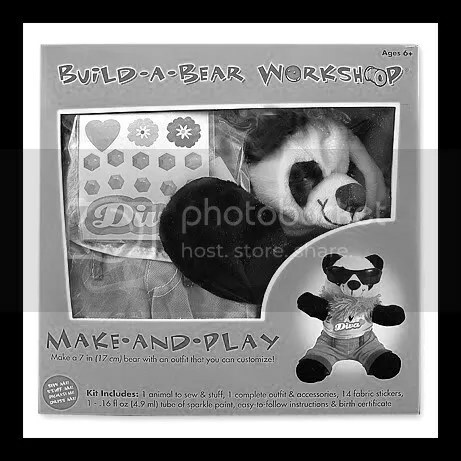 I am really happy that the company has put out this inexpensive all-inclusive crafty package for people like me who really want their kids to get a chance to actually build a darn bear without fussing with all the (boring and tedious) cutting and pinning that actually doing it from scratch would entail! This little panda isn’t as big or pretty as the one we got in the shop, but T definitely takes more pride in its creation. Still, I would never give up the experience we had ‘building’ a bear in the store (in fact, I want to go back again sometime now that T is less skittish about loud noises), or the beautiful sparkly bear named Lavender that she ‘built’ and dressed that day and loves so much – even a year later (a year for one toy in the world of a kid her age is HUGE) All in all, me n’ Puff just like Build-a-Bear! I think we’ll be doing both types again several times in the future! Now as far as Ro and what SHE thinks about it. 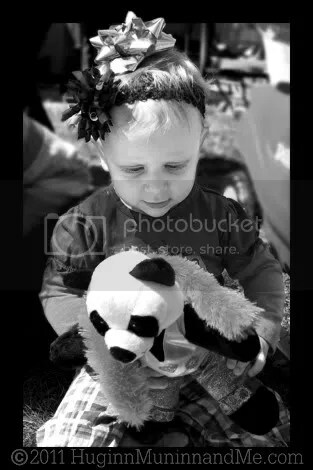 . .
Ro really likes this panda! I’m sure this has more to do with the fact that she’s wearing a hot-pink feather boa and less because big sister T made it especially for her. But as long as Ro is happy, T is happy, and someday she’ll understand such things and it will be even more special to her! 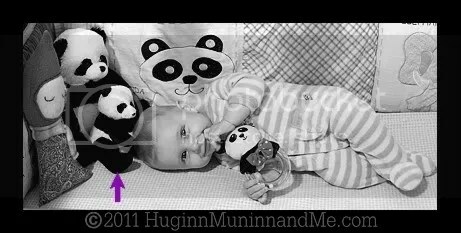 Although she’s sleepily snuggling with it in the picture below, in all honesty, Ro doesn’t usually cuddle this particular panda. . .
No. 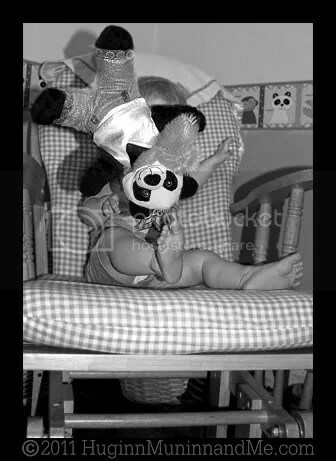 . . for reasons yet undecipherable to my non-toddler mind Ro has designated this particular panda (and ONLY this panda) as the TOSSING panda. I don’t know if this is some random game that her sister started with her one day while I was out of the room, or if Ro came up with it herself, but no sooner does she get this little bear in her hands then it gets thrown as hard as her little self can manage whilst giggling maniacally. Only to be retrieved and tossed again. And again. And again. It’s quite silly to watch! 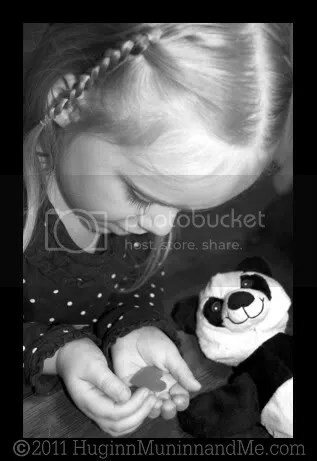 This is not the first panda that has been gifted to Ro by her big sister. When Ro and I were stuck in the hospital during her first week of life, T and her dad came to visit us every day. One day they stopped at a store on the way home so T could pick out a prize for being such a very good girl through all of these sudden changes. 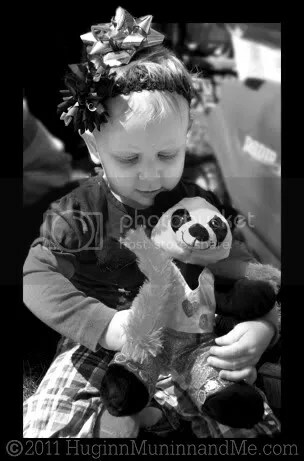 Little T saw a panda on the shelf, and rather than getting a prize for herself, insisted on getting it for her then days-old sister, instead. T often makes sure THAT panda lives in Ro’s crib. . . Ro loves that one, too! What lucky little girls my babies are to have such fantastic sisters as themselves! yes, they ARE! i love them both so much as well as their mom and dad! what a perfect family!!!!!!!!!!!!! A project completed by her little hands is much better than a silly ol’ factory bear any day!!! What a sweet thoughtful sister Ro has!! I LOVE Build-A-Bear. It was a tradition for my most recent nieces and nephews. They also have Build a Doll in the Mall of America, MN. Well, they used to. Anyway, I even had to go do it once just for me. It’s just a great idea in my book. I think your girls agree! So sweet. 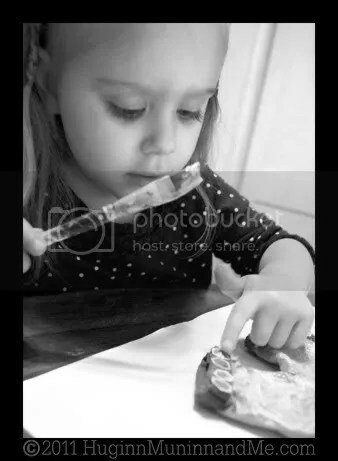 I love how T is growing up believing she can do anything–because her Mommy does and she does too. What a fabulous heritage you’re giving her. ‘ . 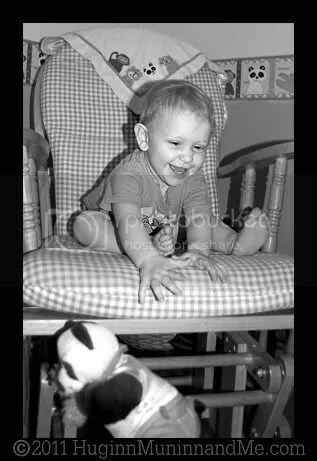 . . whilst giggling maniacally.’ Loved that line, that made me smile. Your girls will probably grow up to be two of the most creative people on the planet. This was such a sweet story. 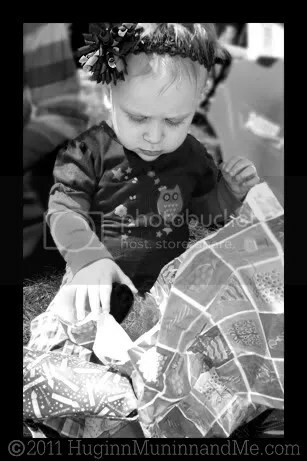 T is very thoughtful of her baby sis and it is so endearing. I feel like I get to know them better by hearing all the stories of their day to day lives. You rock, Mama! oh if i was a bear, i’d definitely be a panda.